I recently started taking piano lessons. I’m 68. At one time in my life I thought a lot about teaching and learning. 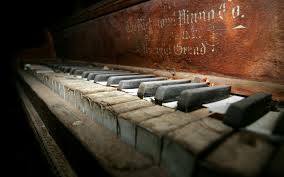 That part of my life is over, but taking up the piano has made me think about learning for the first time in a decade. For a universal experience, it’s poorly understood. What does it feel like to learn? I don’t mean what does it feel like to have learned something. I mean the experience of learning itself. And I don’t mean that sudden aha moment when ideas come together and you feel a rush of understanding. That happens, though it’s rare, and learning goes on without it. I mean the daily experience, in school or out, of learning something new—information, technique, sensibility, perspective. What separates the learning moment from the non-learning moment? Can you identify when learning starts? Are you learning at this exact moment? Has it ended now? Can you tell how long it will last? Have you ever learned something without being aware you were doing so? Is it an act of will? I think we don’t know when it starts, what it feels like while it’s happening, how deep it goes, when it ends, or how long we’ll keep what we’ve learned. Maybe the process is as mysterious as it is common because learning doesn’t exist separately from consciousness—what David Chalmers called ‘the hard problem’. Maybe the idea of learning as a discrete mental activity leads us astray, that the concept is a kind of psychological phlogiston. Still, we do learn. How do we go about it? I’m not a complete beginner with the piano. I had a few lessons as a child from a woman who played in our church, but we didn’t have a piano in the house and getting to the church to practice just didn’t work out. I had a few more when I was in my early twenties, but I didn’t get very far, only the basic scales and a few simple pieces. My situation changed and I sold the piano. I’ve played the guitar regularly since I was sixteen, and I know how to read music, how chords work, elementary harmony. So I come to the current lessons with knowledge that would otherwise take time to acquire, and I can more or less concentrate on learning pieces and practicing scales. That’s good, because my progress is achingly slow. For the last two weeks I’ve been working on the Minuet in G major, BWV Anh 114, 1725, found in the Notebook for Anna Magdalena Bach. Every now and then, while struggling along, a measure or two will ring out and sound like, well, music. The thrill I feel when that happens is partly the thrill of communing across the centuries with Bach; sadly, I’ve learned that he wasn’t the composer. Oh well. I’m sure Christian Pezold was also a terrific guy. I think my progress would be about right for a modestly gifted eight year old piano student. Twice a day I work on the piece and practice my major scales. It’s coming along. But was I this slow when I was twenty? The young learn by osmosis. Ideas are just in the air and then you know them. Oh look, here’s European history in my pocket—how did that get there? But with age we have to make explicit the process that was once implicit. So I slow down as much as I can while playing, ridiculously slow, with just enough continuity between the notes to keep the phrasing alive. And I isolate the difficult measures and practice those separately. Still, I can lose the thread in the middle and watch my fingers stumble over each other like a drunken chorus line. Or some part that two minutes ago I had down pat now makes no sense at all and I have to reboot from the beginning. But the task is compelling, and the small victories are sweet. The first time I played the Minuet all the way through without serious mistakes, I was flying. And this is for a very small, very easy bit of music. God, what must it be like to master a mighty concerto for piano and orchestra? I’ll never know. But I might someday get through the Moonlight Sonata. Or just romp around, sight-reading popular music. How much should what it’s possible to achieve in a long life inform the goals of an old learner without a long life ahead? Should it matter that I just won’t have the time left here on the material plane to achieve excellence? How apt is ambition’s spur when the horse heads home? It’s easy enough to say, well, just do it if you enjoy it, and stop if you don’t. Live in the moment. But while I agree with that, I’m not completely convinced. Would it make sense to start medical school at 80? What if I really enjoyed medical school? What I’ve learned about learning, without understanding it, is that both the quality of our attention and the role of the imagination are crucial. To fully attend is to fully give yourself over to something. We talk about mastering a subject but really the opposite is true. Piaget said we learn by either assimilating the new into the old, which disturbs nothing but enriches our understanding, or by accommodation, which is to say we move our minds over and make room for something that changes our mind in the process. The first is good for keeping your distance while filling empty niches in the memory palace; in the second you know the world by becoming the world. And conscious learning is impossible without first imagining what the outcome of learning will be. Age makes both styles easier in some ways and harder in others. You have the time for it, if you’re lucky. Less attention goes to getting, spending, working, and parenting. And maybe you’ve gained the wisdom to know what you should attend to. Distractions that once confounded your focus can now be ignored. On the other hand, the memory palace is more intransigent about makeovers—the McMansion of memory becomes a moated fort. And manual dexterity is not so dextrous—though it’s still electric when it works. I don’t know if this is true for everyone, but when my eyes, hands, heart, and mind are united in a task I feel completely alive. In those moments, time disappears. As does age. So I’m going on with the lessons. I don’t understand how learning really works, but no one does. I can’t argue that this is the best use of my diminishing time, but what is? I won’t get as far with this as, say, Glenn Gould, but I might get farther than I think. And how mistaken can it be to exercise the imagination, to attend to music making, to struggle against inertia, to dance when the world says sit down? David Noah is an artist living in Winterville, GA.